Enjoy all the fun of the farm with Funky Chicks, a cute video slot from WGS Technology. A playful soundtrack and a cast of cute cartoon chickens make every spin a pleasure. Funky Chicks’ classic five-reel design is a favorite among keen casino players. Meet some new feathered friends in the Funky Chicks hen house. There’s the rooster Funky, his frazzled wife Mother Hen, and the two fluffy baby chicks: Funky Jr. and Tommy. Funky Jr. is an adorable bundle of yellow feathers, while Tommy is the coolest chick on the farm, with sunglasses and a bold rainbow-colored comb. With the ill-tempered farmer brandishing a shotgun, they’re never troubled by the fox. In addition to these barnyard characters, the Funky Chicks slot reels feature the numbers 9 and 10 and the letters A, K, Q, and J. These letters are rendered in vibrant colors to match the game’s cartoon design. All symbols pay left to right except for the Mother Hen scatters. Funky Chicks’ five reels are set against a traditional wooden hen house. The main game controls are on the right side of the screen. Additional controls run along the bottom of the screen, nestled among a pile of freshly laid eggs. Funky Chicks has a traditional video slot design, with five reels and 25 pay lines. Click the Spin button on the right to spin the reels or click the Autoplay button above it to activate automatic mode. Funky, the head of the chicken household, is a wild symbol that substitutes for all but the Mother Hen scatters. He’s a generous fowl, tripling the payout when he substitutes on any winning pay line. This substantial multiplier is a favorite among fans of the Funky Chicks slot game. Players who spin five Funky symbols get the game’s highest payout of 5,000 coins. Five of his namesake, Funky Jr., gives 1,000 coins, while five Tommy symbols yields 500 coins. Adjust your bet in small one-coin increments using the control on the bottom of the screen or roll the dice and click the Bet Max button on the right for big wagers. The Balance and Bonus displays at the bottom of the screen help you keep track of your winnings. Funky’s lady love Mother Hen plays her part in treating gamers, rewarding them with free spins whenever they spin at least three of her symbols. The more Mother Hen symbols appear, the greater the number of free spins. Three Mother Hens yields 10 free spins, four scatters brings 20 free spins, and five scatters results in the maximum of 30 free spins. Those free spins can be lucrative, with all wins doubled during the feature. Best of all, more free spins can be triggered during the free games bonus. Spin three or more scatters during the free games to really feather your nest! Scatter pays are also generous. While two Mother Hen symbols won’t trigger the free games, you’ll get your wager back to try again. Three Mother Hens returns five times your bet, four scatters brings you a 15 times payout, and five Mother Hens rewards you with 75 times your initial wager. 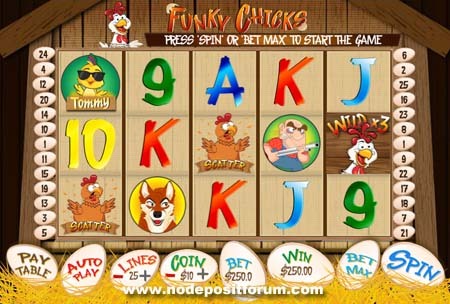 Funky Chicks is a classic slot game, accessible to people new to video gaming and high rollers alike. However, its cast of cartoon barnyard characters adds a dose of whimsy that helps set this video slot apart. There’s no complicated backstory or complex themes to think about, so you needn’t let these chickens put you in a flap. Keep your cool, and big wins could be yours when you spin in the Funky Chicks barn. Play Funky Chicks at a WGS casino such s Miami Club.